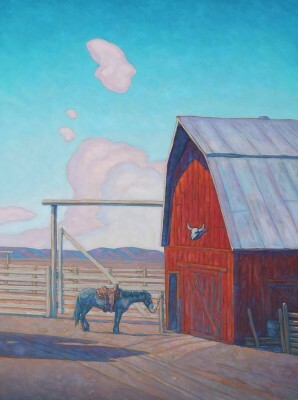 Altamira Jackson is pleased to present a group show featuring today's top western artists including Howard Post, R. Tom Gilleon, Gary Ernest Smith, Dennis Ziemienski and Ed Mell. Collectively in over 50 museums worldwide, this group of exceptional artists has helped shape the landscape of Western Art today. They each have their own distinct styles and though rooted in traditional subjects and technique, their modern interpretations are revitalizing the classic genre. Over 45 new paintings will be featured in this exciting exhibition. The show includes evocative National Park- themed paintings from Dennis Ziemienksi, a brand new series from Gary Ernest Smith, "Heroes and Villains", and a unique installation of R. Tom Gilleon's signature subject, "10 little teepees". Howard Post's distinctive colors and strong shadow patterns shine in both oil and pastel, while Ed Mell's dynamic vistas and dramatic skies energize the western landscape. Join us for the Artist Reception Thursday, July 13th from 5:30-7:30pm at our Jackson location. Howard Post is known for his unique aerial perspectives and modern, impressionistic viewpoint. His use of high perspectives renders people and animals in his works with exceptionally strong shapes and patterns. Strong, orderly shadow patterns cast by the figures of cattle, cowboys, trees, or fences define his work. Howard's work can be found in museum collections including: Denver Art Museum, The Forbes Foundation, the National Cowboy and Heritage Museum, Tucson Museum of Art and the Whitney Western Art Museum. A book of his work, "Howard Post: Western Perspectives", by Jerry N. Smith, was published in 2013. 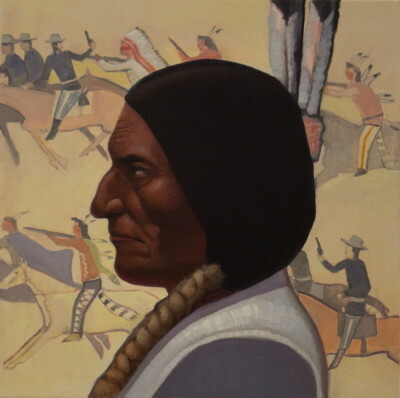 R. Tom Gilleon 's paintings portray the spirit and enchantment of the West, his artwork grounded in the geography, history and narrative of life there. A master of color and composition, Gilleon manipulates formal elements to depict time-honored Western themes in new and inventive ways. 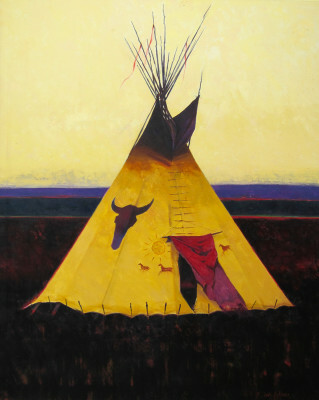 His trademark teepee paintings suggest a mythical glow, as if illuminated by the moon or glowing embers within. Gilleon was the featured artist for the 2009 Jackson Hole Fall Arts Festival. In March 2013, his painting, "Hair Apparent," set a record at auction. He is the first living artist to have a solo show at the C.M. Russell Museum: Let Icons Be Icons: The Art of R. Tom Gilleon, August 16-December 28, 2013. Gary Ernest Smith's work is grounded in his youth in rural America, a time he has artistically interpreted. His art often celebrates the values of hard work and self-reliance, and, more recently, the evolution of contemporary rural America. These aspects of Smith's life are the catalyst for his distinctive style. Smith's work has been collected by museums and collectors internationally. His work is in the permanent collections of the Phoenix Art Museum; Denver Art Museum; Museum of American Art, Youngstown, Ohio; Springville Museum of Art; Buffalo Bill Center of the West; Desert Caballeros Western Museum; and other prestigious institutions. A book of his work, Holding Ground: The Art of Gary Ernest Smith by Donald Hagerty, was published in 1999. Dennis Ziemienski is known for juxtaposing the classic cowboy life with the increasing influence of Modernism. Dennis's ability to capture the essence of time and place, as well as nostalgia for the great American West makes his paintings evocative and timeless. 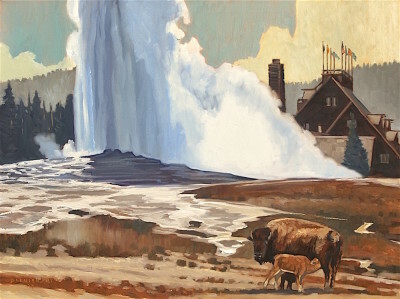 Carrying on the popularity from his recent show celebrating the National Parks, there will be several new works inspired by iconic imagery from Yellowstone, Monument Valley, the Tetons and more. Museum collections include: the Whitney Western Art Museum in Cody, Wyoming; Scottsdale's Museum of the West, Scottsdale, Arizona; and the Tucson Museum of Art, Tucson, Arizona. Major commissions include: Time-Life, Levi-Strauss, Rolling Stone, and The New York Times, in addition to Super Bowl XXIX, the 2006 Kentucky Derby, and the Sonoma Salute to the Arts. Ed Mell brings an architectural eye to the desert, emphasizing graphic elements and stripping away details that do not serve his vision. From landscapes to storms, longhorn cattle to desert flowers, he presents the American Southwest in bold colors and lines. His work is in prominent collections including: the Eiteljorg Museum, The Phoenix Art Museum, Scottsdale Center for the Arts, Anschutz Collection and the Rockwell-Corning Museum of Modern Art. His biography, Beyond the Visible Terrain: The Art of Ed Mell, was published in l996.